Ketchum’s Adrienne Lyle of River Grove Farm shows her exuberance in competition last weekend in New Jersey. She earned a trip to London, where she will compete as an individual in August at the 2012 Summer Olympic Games. Photo copyright 2012 by Nancy Jaffer, used with permission. Ketchum resident Adrienne Lyle and horse Wizard of Hailey's River Grove Farm have earned a berth on the 2012 U.S. Olympic dressage team. Lyle and Wizard, collecting their first Olympic berths, were among four American riders and five horses chosen Saturday, June 16, during the U.S. Equestrian Federation Dressage Festival of Champions and USEF Dressage Olympic Selection Trials at Gladstone, N.J.
Lyle, 27, will be competing for an individual medal in Greenwich Park at London during Aug. 2--9 on Wizard, a 13-year-old Oldenburg gelding owned by Parry and Peggy Thomas of Hailey. The pair are former national champions at the Young Adult level. Team competition begins Aug. 2 and ends with individual freestyle Aug. 9. U.S. team coach Anne Gribbons told www.dressage-news.com that up to six horses will ship to England on July 9 after a final veterinary exam. They will be based at a location 90 minutes northwest of London in a private barn and will take part in an unofficial show at Hickstead open to all Olympians as a final warm-up for the London Games. Besides Lyle, the selected riders were Steffen Peters, 47, of San Diego, Calif.; Tina Konyot, 50, of Palm City, Fla.; and Jan Ebeling, 53, of Moorpark, Calif.
Two-time Olympian Peters is the only rider on the newly named U.S. team with previous Olympic experience. Ebeling is riding a horse named Rafalca owned by Ann Romney, wife of Republican presidential candidate Mitt Romney. Heading into the last day of competition at the Olympic trials, Lyle was in fifth place, behind Ebeling and Rafalca. Only the top four in the final standings made the Olympics. Both Ebeling and Lyle moved up a place to clinch the berths. Peters, the qualifying rider with the most Olympic experience, told www.dressage-news.com that the highlight of the recent competition for him was the "life-changing" success of Lyle. Lyle said, "There's nothing like having to go very last on the last day, last chance, and knowing you have to put in the ride of your life. "But Wizard did it!" For the past six years, Lyle has competed in California, the East Coast and Europe. She was ranked second in the U.S. going into the Olympic trials, after her first international win in Florida earlier this year. 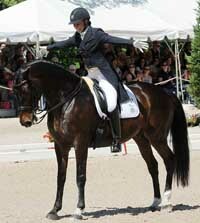 Lyle is coached by Debbie McDonald, rider of Brentina and one of only two Americans to win the World Cup Final. She is the daughter of Greg and Ann Lyle of Sun Valley. She grew up in Ketchum and Whidbey Island, Wash., showing a passion for horse competition from an early age.